Picture Search Results. page 61 of 146. (from page 10 of the 1976 Collection) The 1976 Mustang MPG package of the 93hp 2.3L 4-cylinder also came in the luxury sport optioned Ghia coupe. The Ghia came standard with half vinyl roof, pin stripes, body side moldings, color-keyed mirrors, and luxury interior. This car has been upgraded with wire wheels and bumper guards. This photo is also in the 1976 Ford Mustang promotional catalog. (from page 10 of the 1976 Collection) Dark Red 1976 Mustang II coupe with Ghia luxury package which included half vinyl roof, body side color keyed side moldings, color keyed sport mirrors, fog lamps, and a luxury interior. (from page 10 of the 1976 Collection) 1976 European Ford promotional brochure showing some of the Ford's exported to Europe but focuses on the Mustang. The cover shows a Silver Mustang Ghia coupe with half black vinyl roof, sun roof, wire wheel covers, and front bumper guards. (from page 10 of the 1976 Collection) This is the cover of the 1976 Ford sales brochure which shows the Ford car line-up for 1976. The lineup includes Pinto, Maverick, Mustang II, Granada, Torino, Elite, LTD, and Thunderbird. (from page 11 of the 1976 Collection) Cool Ford promotional photo of a Polar White 1976 Mustang Cobra II with blue interior, t-tops, hood scoop, rear quarter window louvers, and sport wheels. (from page 11 of the 1976 Collection) Check out this photo of a Polar White 1976 Mustang II Ghia notchback. It's a HDR photo. This Mustang II has a white half vinyl top, blue interior, automatic, and the 2.8L V6 engine. (from page 11 of the 1976 Collection) This is an information card for the 1976 Mustang II Limited Edition Special Value Package which is available on the two-door hardtop and three-door 2+2 hatchback. The package content is listed as special lower body tutone paint combinations, dual accent bodyside tape stripes, styled steel wheels with trim rings, special seat inserts, and brushed aluminum instrument panel applique. There is also a package "A" option which includes forged aluminum wheels. Exterior two-tone color combinations are listed as Creme over Gold, White over Red, and White over Blue. 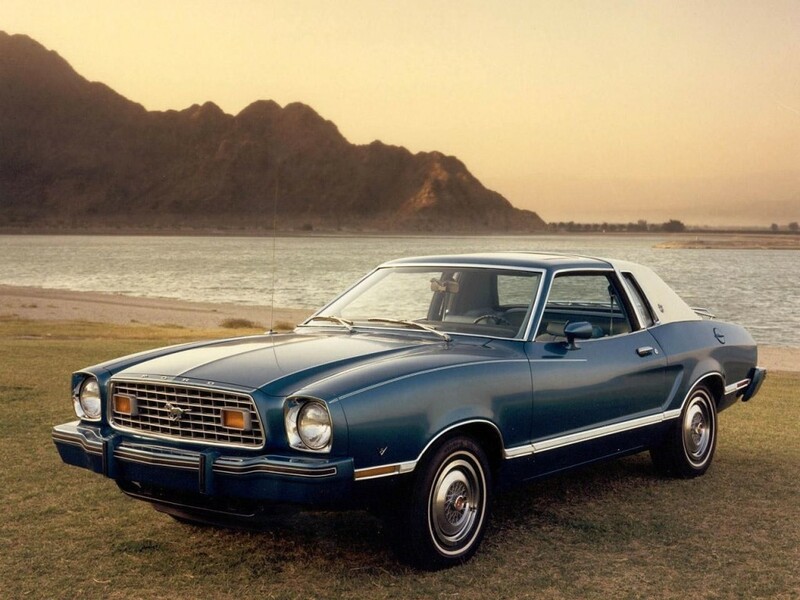 (from page 11 of the 1976 Collection) This is a Ford promotional photo of a 1976 Mustang II Limited Edition Special Value Package which includes the two-tone Cream over Gold exterior paint. The package content is listed as special lower body tutone paint combinations, dual accent bodyside tape stripes, styled steel wheels with trim rings, special seat inserts, and brushed aluminum instrument panel applique. Other exterior color combinations include White over Red and White over Blue. (from page 11 of the 1976 Collection) This is a Ford promotional photo of a Polar White over Red 1976 Mustang II Limited Edition Special Value Package. This package includes the two-tone paint, tape stripes, styled steel wheels with trim rings, and inside special seat inserts and brushed aluminum instrument panel. (from page 1 of the 1977 Collection) Bright Red 1977 Mustang II coupe owned by Terry and Mona Burgess from Victoria BC, Canada. It still as the original 302ci engine under the hood. The owner has this story to share, "Growing up, my Dad had always wanted to purchase a Mustang. He had taken early retirement at 60 years old and seriously started looking at a Mustang as his next car of choice. He looked at many but the little red Mustang II caught his eye and he convinced my Mom that the little red girl was the one. He couldn't wait to call me and tell me that he had purchased it. Dad came over to my apartment, picked me up and took me over to the house to see her. My Dad loved his new car but didn't have an opportunity to drive it for very long as he had a stroke and couldn't drive any more. When ever he had to go to the doctor, I made sure to take him in his red jewel. Although he couldn't drive he would have an opportunity to be in it. He never regained his health and before he passed away he signed his very special car to me. I drove my Dad's car every day to work until three years ago until she was hurting for a lot more TLC than I could continue to give her. My husband promised to restore her for me and I must admit that I wasn't totally convinced that he would do it as it was a large undertaking. I only expected for him to get the car running again, but as you can see he has gone far beyond that and restored her back to original condition. The car I loved driving for many years that held tremendous amount of sentimental value for me, is back on the road again and looking and running pretty sweet. I'm sure my Dad would have been pretty proud of how she looks."